Christmas is a popular season at Tokyo Disney Resort (TDR), with both Disneyland and DisneySea getting into the festivities with themed food, merchandise, shows and decorations including countless Christmas trees. This year, Disney Christmas starts on 9 November and goes through until Christmas Day, 25 December. This is a guide to what you can look forward to at Tokyo Disneyland and DisneySea over Christmas 2015. Each year, the two parks, Disneyland and DisneySea have their own Christmas theme. Tokyo Disneyland’s Christmas season is known as Christmas Fantasy, and the theme for 2015 is “Christmas Storybooks”, inspired by scenes from Christmas themed stories, and of course featuring plenty of Disney characters. The “Tokyo Disneyland Electrical Parade – Dreamlights” will run every evening, featuring characters in Christmas costumes, set to Christmas music, and the Starbright Christmas fireworks will light up the skies each night. 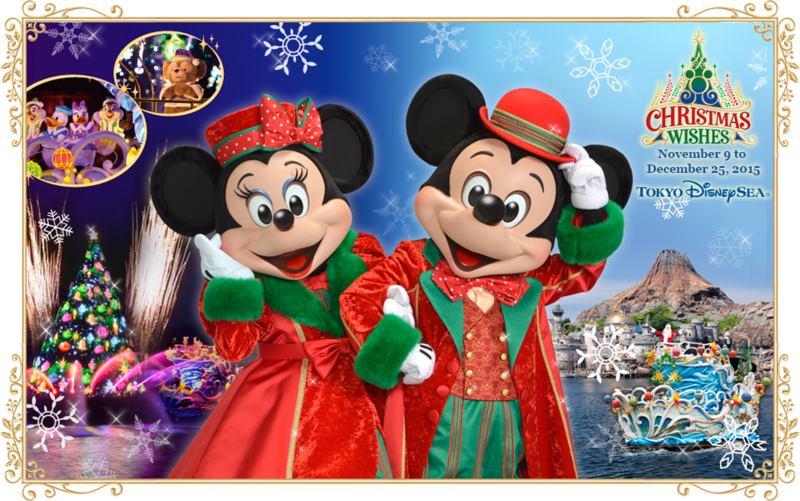 DisneySea’s annual Christmas season is known as Christmas Wishes, with the theme for 2015 being “A Perfect Christmas”, as well as incorporating the “Colors of Christmas” show on the Mediterranean Harbor. “A Perfect Christmas” performances will run three times a day, lasting around 25 minutes each, and “Colors of Christmas” will every evening, lasting around 13 minutes. The Starbright Christmas fireworks will happen every night, with fireworks shaped like stars and bells, and a soundtrack of Christmas music. To get an idea of what to expect, check out my posts on last year’s decorations at Disneyland and DisneySea. Different seasons at Tokyo Disney Resort come with different, limited treats to eat. Christmas tree shaped chicken rice with scrambled eggs from the Crystal Palace buffet. Strawberry cream tarts with candy canes from Crystal Palace Buffet. Olaf strawberry cream sandwich cookies from Crystal Palace – these will also be available at one of the outdoor booths to be confirmed closer to the time. They’ll also be available at DisneySea. White chocolate and pistachio mousse in souvenir cup from Sweetheart Cafe. White chocolate mousse with candy canes from Sailing Day Buffet. Cranberry mousse in a souvenir cup from Zabini Brothers Ristorante. Micky Mouse Christmas stocking lolly holder – available from several outlets around DisneySea and Tokyo Disneyland. There will, of course, be plenty of Christmas themed Disney merchandise at both Disneyland and DisneySea. Some will be the same at both parks, while other items will be unique to each park. Above: Tokyo Disneyland’s Christmas Mickey and Minnie. Above: DisneySea’s Christmas Mickey and Minnie. Aside from having different outfits for each park, the outfits also change each year. The year is printed on the bottom of the left shoe, so if you collect these, it’s easy to tell which year and park they come from. Disneyland Christmas Fantasy 2015 mug – again, the designs change every year. Christmas Wishes 2015 tea cut and saucer. If you’re a fan of Frozen – and Olaf in particular – the good news is that there is heaps of Olaf themed Christmas merchandise this year! Tins of biscuits and other treats are always a winner, with a variety of different treats available at each park. I’ll be spending a few days at Tokyo Disneyland and Disneysea over the Christmas season, so stay tuned for more information in early November. Credit goes to Tokyo Disney Resort for all of the images used in this post.